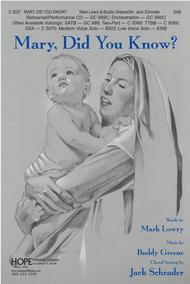 Mary, Did You Know? 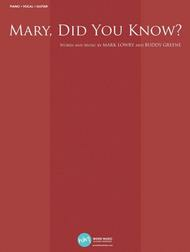 composed by Mark Lowry and Buddy Greene. For Piano/Vocal/Guitar. Piano Vocal. Contemporary Christian and Spiritual. Difficulty: medium. Single. Vocal melody, piano accompaniment, lyrics, chord names and guitar chord diagrams. 6 pages. Word Music #080689416279. Published by Word Music (HL.309784).ISBN 0634043056. With vocal melody, piano accompaniment, lyrics, chord names and guitar chord diagrams. Contemporary Christian and Spiritual. 9x12 inches.This sheet music features an arrangement for piano and voice with guitar chord frames, with the melody presented in the right hand of the piano part as well as in the vocal line. Mary, Did You Know? composed by Buddy Greene. Arranged by Jack Schrader. For SATB choir. Hope's All-Time Best Selling Choral Series. Gospel, Contemporary, Devotion, Christmas, Sacred. Octavo. Published by Hope Publishing Company (HP.GC999).The talented arranger, Jack Schrader, has perfectly captured the sweeping, epic drama of this powerful contemporary Christian, Christmas song. A Low Voice setting in the key of B-flat minor with keyboard accompaniment is available. The original Medium Voice setting in D is compatible with the orchestral accompaniment and rehearsal/performance CD. The orchestration contains a Conductor's Score and parts for: Flute, Oboe, Clarinet, Horns 1 & 2, Trumpets 1, 2 & 3, Trombones 1, 2 & 3, Percussion 1 & 2, Harp, Rhythm, Violin 1, Violin 2, Viola, Cello and Bass. 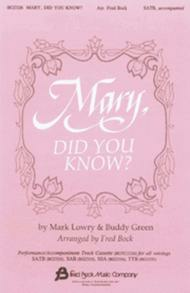 Mary, Did You Know? arranged by Fred Bock. For Choral (SATB). Fred Bock Publications. Choral, Sacred and Christmas. Octavo. 12 pages. Fred Bock Music Company #BG2326. Published by Fred Bock Music Company (HL.8738986). 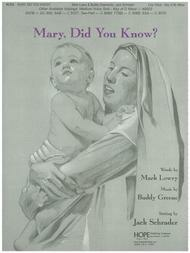 Mary, Did You Know? composed by Buddy Greene. Arranged by Jack Schrader. For SAB choir (2-part). Hope's All-Time Best Selling Choral Series. Gospel, Contemporary, Devotion, Christmas, Sacred. Octavo. Published by Hope Publishing Company (HP.C5037).The talented arranger, Jack Schrader, has perfectly captured the sweeping, epic drama of this powerful contemporary Christian, Christmas song. A Low Voice setting in the key of B-flat minor with keyboard accompaniment is available. The original Medium Voice setting in D is compatible with the orchestral accompaniment and rehearsal/performance CD. The orchestration contains a Conductor's Score and parts for: Flute, Oboe, Clarinet, Horns 1 & 2, Trumpets 1, 2 & 3, Trombones 1, 2 & 3, Percussion 1 & 2, Harp, Rhythm, Violin 1, Violin 2, Viola, Cello and Bass.